Xtreme is a small, exclusive trip with our most experienced river guides taking you on the wildest ride possible. It’s faster … it’s a greater rush .. it’s extra challenges … it’s XTREME! What is the difference between Tully Rafting and Xtreme Tully Rafting? By restricting our Xtreme trip to only 24 people, we are able to customize the trip to the abilities of the lucky few traveling with us today, taking you on the wildest ride possible.Because this small trip can move much faster down the river, we have time for extra adventures such as jumping from the cliffs into the river, swimming down the rapids with your safety gear on, and raft surfing where your boat is held in place by the power of the rushing rapids. Why must I have a good command of the English language? 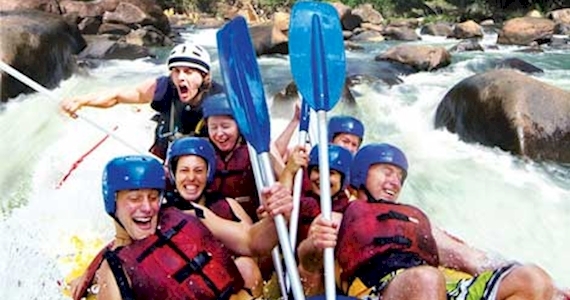 Xtreme rafting incorporates extra challenges which require quick and immediate response to commands given by your guide. All instructions and paddling commands are given in English.